There are certainly a lot of ways to cook a turkey: you can roast it, smoke it, or grill it. If you want to get fancy you can braise it, fry it in oil, bake it in a bag or chuck it in a slow cooker (I have a loose definition of "fancy"). Want more options? You can stuff that baby with a beer can, dressing or stuffing (they're different), vegetables and herbs or another bird (which is disgusting, if you ask me). But, despite all the options and cooking methods, all have one potential outcome that is feared by guests and hosts alike: You can cook that turkey til it's drier than an elephant's elbow. Blech. Luckily, this outcome is easily avoided. A good brine and a dual temperature heating process will leave your turkey deliciously crisp on the outside and juicy on the inside. Lucky for you, I've got just the recipe. - Cool to room temperature. - Remove neck and giblets. - Rinse turkey thoroughly (inside and out) with cold water. - Put turkey in a large zip lock bag (bags make clean up a snap!!). Add brine and 1 gallon iced water. 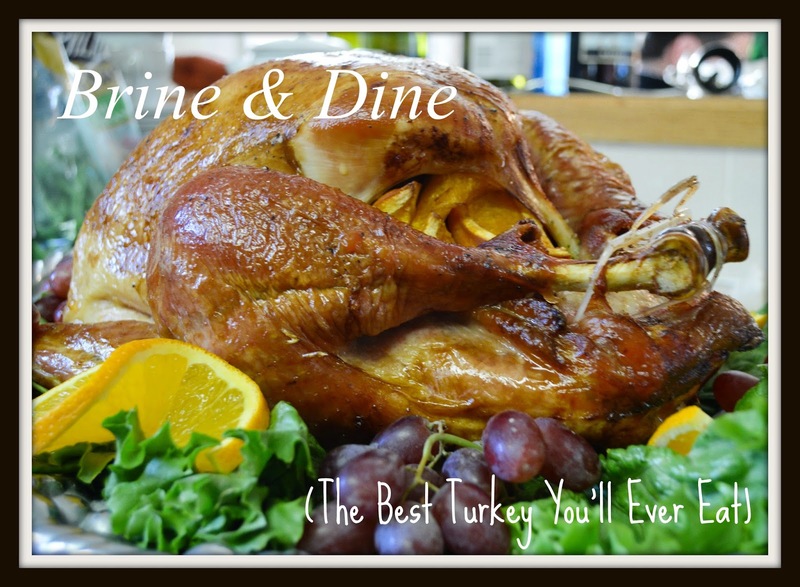 - Make sure that turkey is completely submerged in brine, breast side down. - Place bagged turkey in a bowl, or roasting pan and add to fridge OR place in cooler and cover with ice (this works well if your refrigerator is already full to bursting). - Place on drying rack and pat dry with paper towels (inside and out). Make sure turkey is completely dry. - Take 1 sliced apple, 1/2 onion sliced, and 1 cinnamon stick and place in a microwave safe bowl. Heat on high for 3 minutes. - After heating, place contents into cavity of turkey. - Add 6 sprigs of rosemary and 6 sprigs of thyme to the inside of the bird. - Using butcher's twine, truss the bird. - Fold wings under bird to prevent burning. - Liberally coat turkey with canola oil. - Sprinkle with kosher salt and fresh cracked pepper. - **Create an aluminum foil tent to cover just the breast of the turkey. Set aside. - On the lowest rack of preheated oven, place turkey in, legs first. - Cook at 500 degrees for 30-35 minutes. - Reduce temperature of oven to 350 degrees and continue cooking for 2 - 2 1/2 hours, or until the internal temperature of the deepest part of the breast reaches 160 degrees Fahrenheit. Once removed from the oven, the bird will continue to cook (coast) as the temperature drops and will reach the required 165 degrees. This prevents over drying. **If, during the cooking process the breast becomes overly brown, apply the aluminum foil tent. - After removing turkey from oven, loosely cover with aluminum foil. Allow to rest for at least 15 to 20 minutes. Turns out the bird really IS the word. That or possibly "Mmmmmmmm."